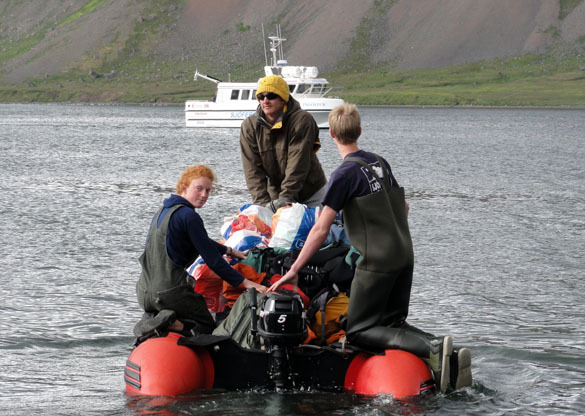 West Fjords, Iceland – We’re happy to report that the 2011 Iceland Keck crew has safely completed a productive field season. Nearly two weeks ago, a boat dropped us off in Hornstrandir, a nature preserve that encompasses most of the northern portion of the West Fjords. 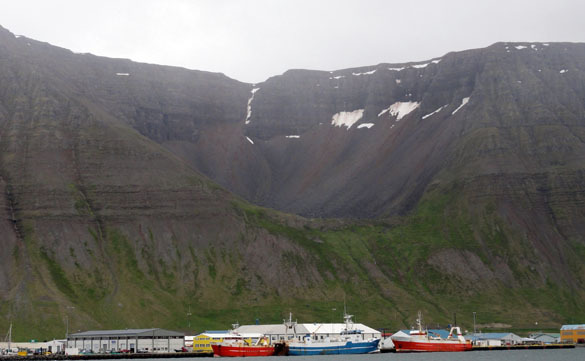 Our field area centered around Hrafnsfjordur, or Raven Fjord, in the southern extent of Hornstrandir. 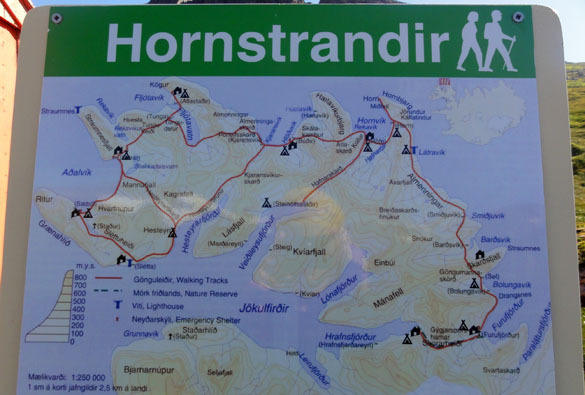 We had no idea that Hrafnsfjordur was a popular destination; it’s one of the primary drop-off and pick-up points for backpackers in the region. We must have seen at least half a dozen hikers during our stay. Hiking trails snake their way around the fjord and over the passes, which was fortunate for us since we had to access all of our field areas on foot. A very still day in Hrafnsfjordur. After a couple of days of recon hiking as a group, the students selected their projects and went to work. Most students chose to map a portion of the fjord, although one student focused on mapping and sampling dikes. Students worked in teams of two, each team being assisted by a faculty member. 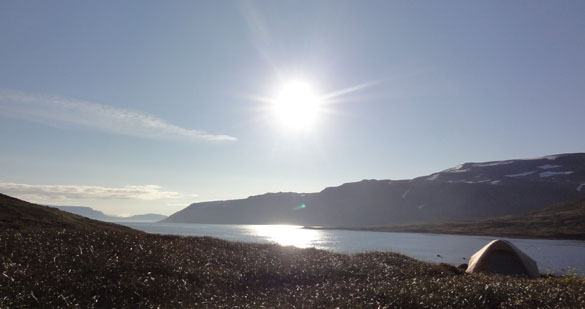 A very sunny day in Hornstrandir. Field work was challenging. 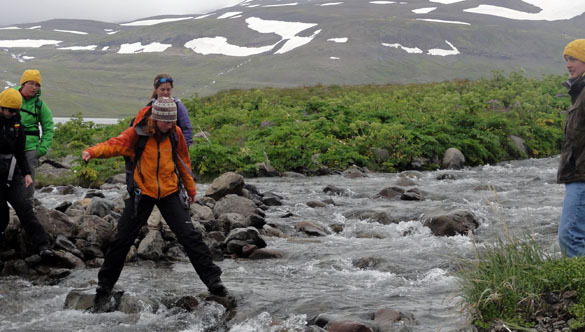 Like our Alaskan colleagues, we had dramatic stream crossings, treks across snow, and hikes up steep terrain. Although we never saw a bear, we spotted an arctic fox in the distance. Thankfully, the fox wasn’t interested in our food. Dehydrated meals at the end of a long field day never tasted so good! Coast guard performing drills outside our hostel in Isafjordur. The weather was mostly good, by Iceland standards. It seems as if we were constantly confronted with either bugs, wind, or rain, but always just one at a time. Whenever Emily worked in her area, though, the sun would shine! Hiking up snow to reach the peak. We took a chartered boat back to Isafjordur on Wednesday and spent one last day in the field mapping a local mountain called Sauratindur. Now that we’re finished with field work and have returned to civilization, we realize how thankful we are for hot showers and soft mattresses. Still, there are some things that we’re already missing: the view from our tents, the sound of the waterfall (especially at night), the soft moss, our own private fjord, the hot cocoa, our special treat at the end of each day, and the freshness of the air. Our Keck adventure in Hrafnsfjordur, in Hornstrandir. Tomorrow, we start our long journey back to the states (via Reykjavik). We’re eager to get back to Wooster to start processing our samples. Hrafnsfjordur offered us an amazing amount of what we think are intermediate lava flows, which would be unique for Iceland. Dominated by basalt with local regions of rhyolite around central volcanoes, intermediate lavas are relatively sparse. Our field mapping, thin section observations, and geochemical analyses should yield some insights into the formation of Hrafnsfjordur’s central volcano. Stay tuned! Panorama from the top of Manafell in Hrafnsfjordur. 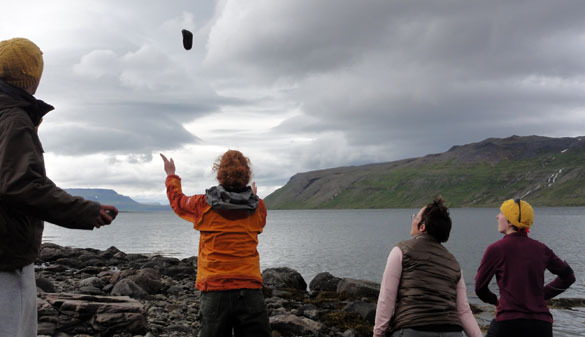 Students playing a game of rock while waiting on the boat. 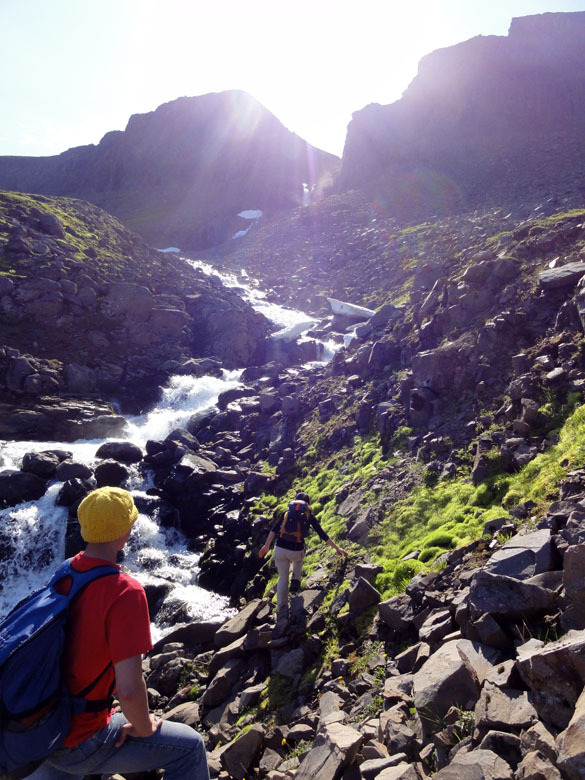 Textbook hanging valley in Isafjordur. The boat that came to pick us up- one trip for gear and rocks! The view from my tent in Hranfsfjordur, Keck. Familiar scene for geo types- hiking up waterfall cuts for good exposure. Spectacular! We are looking forward to seeing you all in Wooster. It looks as if the team was successful and wow, what beautiful scenery!! Iceland is such an amazing country. Good luck with the processing!